Jason and I have been location independent for over five years now. We currently live, work and travel in a 33ft motorhome and no matter how we phrase it…most people gloss over the work part. The initial reaction from most when they find our site or our YouTube channel is that we must be independently wealthy. We wish! The truth is that anyone can do it. It’s incredibly hard to put aside our fears and excuses and go for our dreams. But today’s Make Money and Travel interview is a prime example of a family that did just that. It’s an honest look at the fears they faced, the realities of working as a nomad and the happiness they’ve created as a result. Jessica (graphic designer/branding specialist), Will (CPA), and their two free-spirited kids Avalon and Largo. Also known as the Goodie Goodie Gumdrop crew. Tell us about yourselves and how you became nomads. Hello everyone. We are the Sueiro family formerly from all over the US, but most recently from Cambridge, Massachusetts. 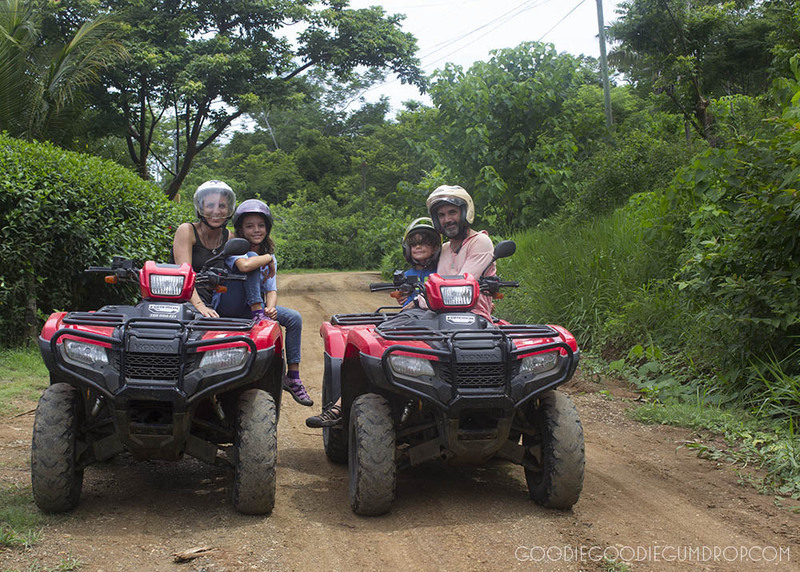 We set out on a one-year adventure to Costa Rica in order to immerse our children in a rich culture and to spend copious amounts of time together. Well, long story short, we loved it. We had always fantasized about switching countries every year or two with our children, but we never thought it was theoretically possible. Guess what? It is and we did it. It took a lot of blood, sweat and tears (lots of tears), but the outcome has been a life we thought was only obtainable in our dreams or for the uber wealthy, which we are not. Today we are on our second year of travel and we currently call Quito, Ecuador home. Describe your working situation and what line of work you’re in. Since this is a post about making money lets just jump right in. My husband Will and I both work online, but this was not always the case. We were once corporate employees engaging in the rat race day in and day out. I have been working remotely for over a decade as a graphic designer, but Will is brand new to this world. When our first child was born I attempted to negotiate an alternative work schedule at my corporate design job, but the company I was working for declined. They said if they let me they would have to allow anyone else who asked. That day I decided that it was time to branch out on my own and create a work environment that would allow me to customize my day, but also spend time with my child and future children. Cucumber Design was born that day and is still going strong over 10 years later. Several years after opening Cucumber Design we moved to Boston. At the time I was petrified that I would lose all of my Los Angeles based clients because of the lack of face time. Well, I was wrong. My first year in Boston was my busiest year to date, honestly busier than I preferred considering we had added another child to the family. Work continued, the years passed by and then one day we got this crazy idea to travel the world with our children. I was not a bit worried about my work because I had a pretty solid track record of retaining clients from another part of the globe, but Will was concerned to say the least. We are just over a year into this digital nomad, location independent life outside of the US and I can say that the work is still coming in. This career has been really good to me, plus allowed me the flexibility I wanted while raising a family and living in countries outside the US. However, I will be officially retiring as a graphic designer as of January 2016. I have other creative projects that I want to pursue and I am unable to do this with my current workload. Since we have been able to lower our expenses by living outside the US I now have the opportunity to focus my professional aspiration’s elsewhere. In addition, I will be turning our real estate investing hobby into more of a full time income stream, hopefully. My husband is the one with the more interesting story. Will, a CPA, was in Public Accounting for seven years and in corporate accounting for an additional seven years (the guy definitely gets the itch). This is not to mention his days working for cruise lines. He has been pressed, groomed and well dressed to enter the rat race for as far back as I can remember. When we made the decision to pursue this travel life on our own (without a lofty expat package) he was the first to freak his you know what. How would he find work? Did his area of expertise require him to sit in a corporate office forever? Would we be able to eat? Of course, me being the eternal optimist, glass is half full, we can do anything type I assured him that he was smart, experienced and capable. I knew that he had handfuls of contacts from decades in this industry and once they realized that they could lower their expenses by hiring him from off site he would be golden. Will made the frightening decision to put in his notice at his current employer almost two years ago. We took off on our adventure 15 months ago and I am happy to report we can put food on the table, save for retirement and pay our medical bills. I cannot pretend that the road from “resignation to now” has been bump free, but it has proved to be much more than we had ever imagined. 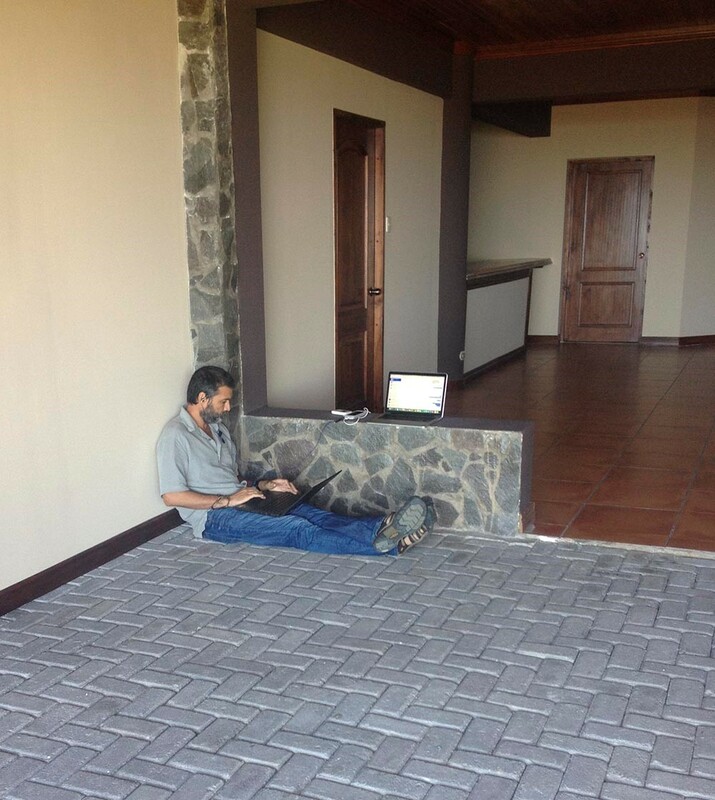 Will found work online almost immediately after we landed in Costa Rica. It was clearly not as much as he had been making when we left the US, but we did not need as much considering we had lowered our expenses by almost 75%. As luck or hard work may have it (I tend to believe the later) former colleagues called him after six months in Costa Rica and asked if he would be interested in working as a contractor with the freedom to work from a country of his choosing. Yippee! And that is pretty much the end of the story folks. He makes about the equivalent as he made in the US (sometimes more, sometimes less). It is not always ideal since the work is project based. He often has to travel to Asia for weeks at a time and frequently has conference calls at 2 am or 11pm. Plus, we now have to pay our own medical, we don’t have company profit sharing and of course if he is not working then he does not get paid. However, he works from home. We see him a lot, sometimes have lunch together and he can occasionally pick Largo up from school or work on Avalon’s schooling with her. It’s a win-win, the company does not have to pay benefits or worry about office space and we get to live the life we want. This big risk has turned out to provide great rewards. I am grateful that we stepped outside our fear and took this plunge. At what point did you realize that you could bring in enough income to continually fund a location independent lifestyle? Both Will and I have been in the same line of work for several decades now. Although, as I stated above I am ready to branch out into other streams of income that I feel align more with my current professional goals. It depends on whom you ask. If you ask Will he will say that we still have not realized that we can bring in enough income to continually fund a location independent lifestyle. We are both contractors and at any point we can lose a client and money. This is always in the back of Will’s mind. Me on the other hand, well, we are doing it and I believe we can continue to do it. If a client goes away then we get another one. If an industry or career becomes obsolete then we reinvent. I am currently in the process of reinventing primarily from burn out and other dreams I want to pursue. I know we can and will always make money, but the capacity at which this takes place in may vary. Plus, we always have the option to move to a less expensive country or simplify our life more. For me the question is not about when we realized we could fund this location independent lifestyle, but more about when we realized that we had to find ways to always fund this location independent lifestyle. When you change the way you view the process the options become limitless. This lifestyle really works for our family; therefore I will do whatever it takes (obviously within reason) to make money in order to continue to live it. Has deciding to travel and work been a good decision for you? Has it improved your quality of life, added more freedom to your life or has it all stayed the same? Overwhelmingly yes! YES! YES! YES! The funny thing is that we truly loved our life in Cambridge, we loved our kid’s school, we loved our family and friends, but we felt a greater calling to travel and that is why we took off on this adventure. Has it improved our life or added more freedom? Well, it really depends on which day you ask us? Ha! We wanted to spend enormous amounts of time with our children. 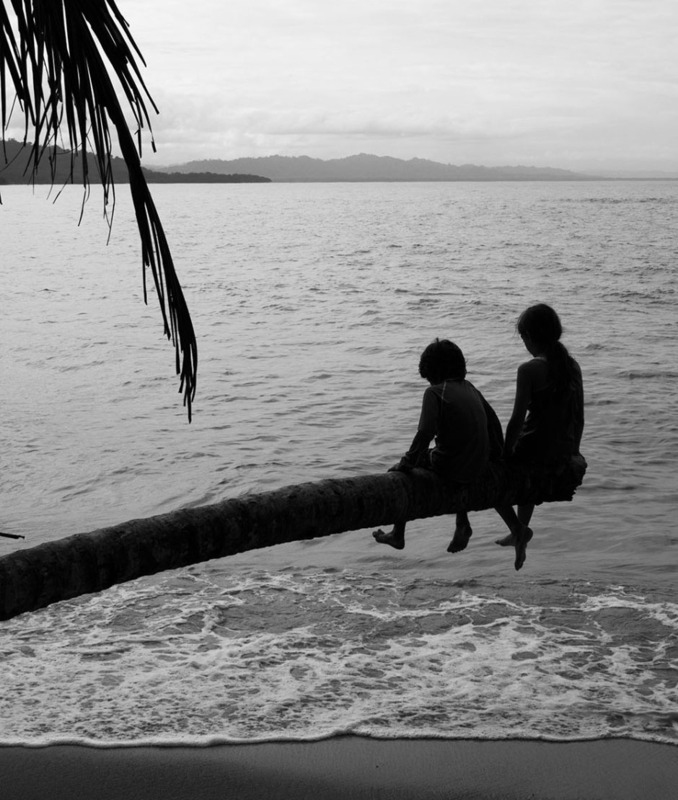 We valued education and we wanted all of us to learn through travel. We wanted the kids to have an epic, out of the box childhood. We wanted to expose them to real world experiences and people who live different from us. We have accomplished all of the above, plus we have grown a much stronger family bond of teamwork and consideration of each other’s feelings and emotions. We now have the time to take a 10-minute break from work in the middle of the day and entertain the big questions that these little people often have. Hands down our quality of life has improved. In regards to our freedom, some days we have a lot and others absolutely nothing. We still need to work and keep our clients happy and sometimes that compromises our freedom, but overall we feel like we are in the driver’s seat of our life for the first time ever. We compromise some freedoms in order to get other freedoms. Some months are crazier work wise than our life in the US and other months are much quieter, but in the end we are seeing the world with our kids and still able to make a living. We think it is pretty darn cool. I put in between 20-25 hours per week with my design work, but I also world school one child, manage our real estate and much more. Some weeks are 60 hours and others are zero. It varies depending on the project and the deadline. There is no typical workday in my life. Since I worldschool one child and the other is in a brick and mortar school here in Quito I juggle my work between their schedules and spend a lot of time working evenings and some weekends. 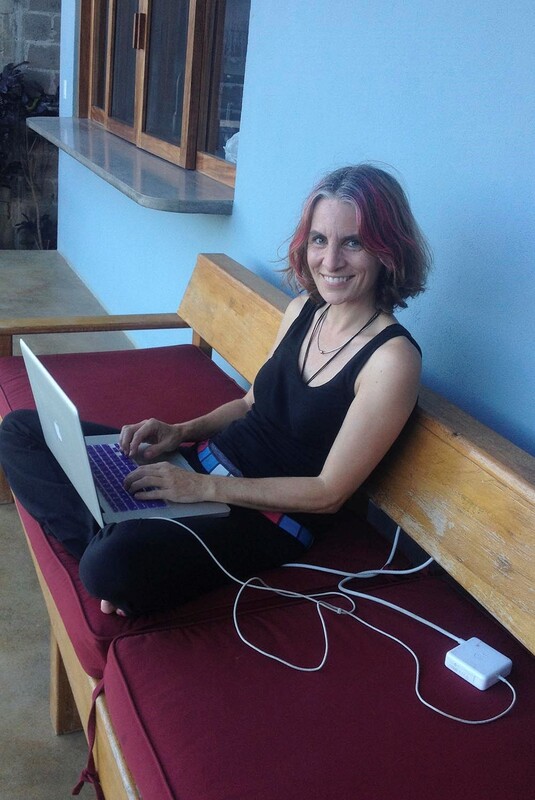 I can often be seen working from coffee shops, outside classrooms, occasionally at home, in airports and once in a while from a bathroom. I have learned to be very flexible and ready to work under any conditions, hence the bathroom. 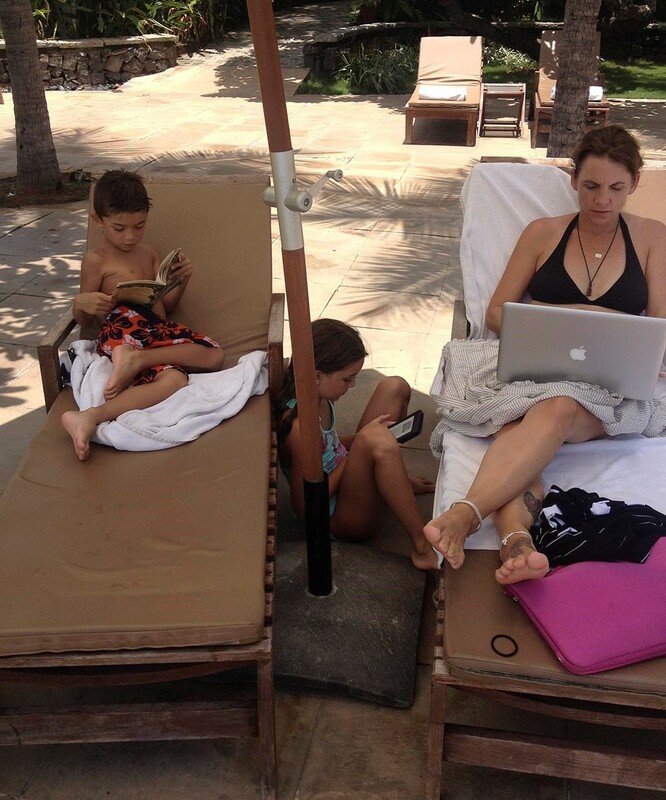 It is not always ideal, my neck and back clearly suffer, but I am able to raise my children, be location independent and travel the world all while working. I have no complaints. For Will, his hours are still a lot (between 45-60). His typical day revolves around the time zone his project is rolling out in. On most days he aligns with an EST time zone work day, but he could also have a 2am or 11 pm call with Asia. Plus, when he travels all bets are off, he works in pretty much every time zone. We both have to be flexible with our vacations and our lunches. We have been known to skip lunch or eat at our desk more often than I care to mention. It is not ideal, but we don’t exactly live a conventional life. We are willing to make these sacrifices in order to have this life we once only dreamed of. If you are willing to say, what is the average yearly salary for someone in your line of work? Will makes a comfortable US salary and that is a very good thing because although we have lowered our daily expenses, we have had some lofty unexpected expenses this year. I make a not so comfortable US salary. Art, well, you all know how that pays, but I have been happy in this career and you cannot put a dollar value on that. We do not live the high life and we try to be fiscally conservative, but we do want to explore the area we are living in as well. Comfort is an arbitrary word. First of all, we do not need much to be comfortable. In fact, for what we are trying to teach our kids, we want to live like we are barely scraping by. We are targeting a less comfortable lifestyle (without sacrificing health and safety). If you were to ask Will, comfortable means having 1 year’s expenses in the bank. We are nowhere close to that. In my opinion, we will probably never get there. I have ambitions of further investing in real estate which will eat into the savings plan. It will pay out more in the long run and we are both prepared to take those risks. I need my computer, the Adobe Creative Suite and an internet connection. Actually I do not always need an internet connection, it just depends on what part of the project I’m currently working on. Will has a client provided laptop. He logs in via a VPN and therefore needs a reliable, secure and fast internet connection. He always carries with him a wifi hotspot. Our handy little hotspot has bailed us out more than we can count. If someone else out there wanted to get into the same line of work, what type of education would they need? College, trade school, nothing? As a designer an education is always a plus, but I know many designers who actually got their degree in a field other than design, myself included. I do recommend art school or a heavy personal education in art, as well as some business classes. If you are going to run a small business it is always an advantage to have an idea how this all works. As for Will they would need a heavy background in accounting and finance with a college degree. Who are your clients? Do you find them or do they find you and how? What is your rejection rate? My clients are all over the US and a couple in Europe. My clients find me through referrals. This was not always the case. I used to do promotions, mailers and cold calls, but once I hit a point where I was overloaded with work I started working with referrals only. I have continued on this path for many years now. My clients are a combination of large corporations looking to outsource some of their in house design work and start ups. Over the years my business has changed drastically. Several years ago I created a niche for myself in branding (which I love) and pretty much 90% of my work today is solely in branding. I have seen a greater rejection rate in the last year or so due to the ability to purchase a logo online for $99. Obviously I charge well over that. I bring a lot of experience, research and much more to the table that cannot be offered for $99. Usually price is the issue with my start up clients and that is where my rejection numbers are higher. The large corporations have the budgets and want to work with someone with experience. I would say that I get 7 out of 10 clients that I pitch. The 30% that I don’t get always try to get me to lower my price, and sometimes I do if they are a start up or not-for-profit I believe in. The referrals come to me so by the time I speak with the client they have usually looked at my website, know my work, have researched other designers and they are ready to go. I don’t have to do a lot to get the work, but if I wanted to grow the business then I would have to come up with a strategy to solicit new customers. Wills clients are former employers and colleagues. He has spent all of his professional life building his network. Will has always worked hard everywhere he has worked, and he is now leveraging his connections for current work. His work ethic is second to none and I am glad to say that it is paying off. What’s the best about working while traveling? Those things that make you think wow, I really am living the dream. 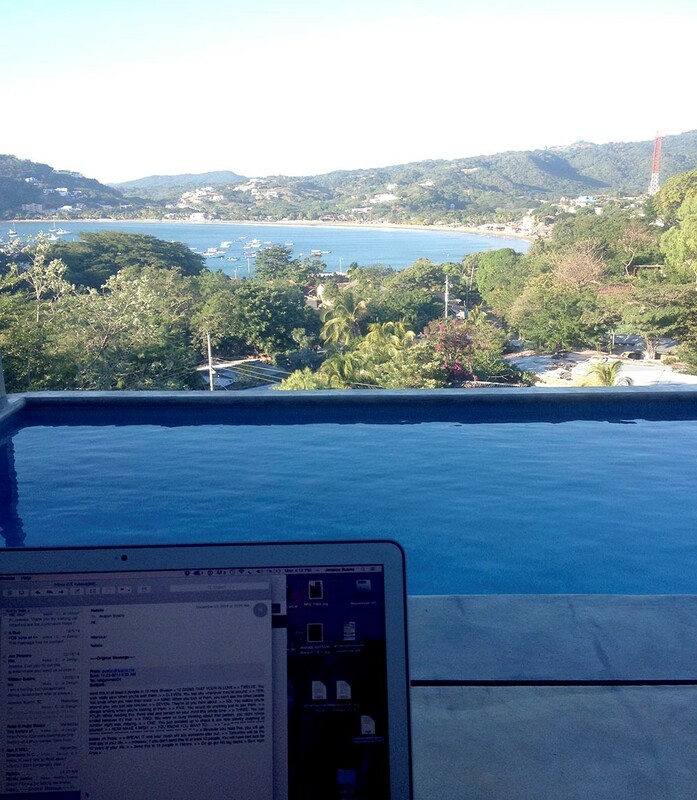 Our three favorite things about working while traveling are the flexibility to work from anywhere, the ability to set our own work hours (me more than Will) and the ability to make a US income while living in a lower cost of living country. As we have traveled about, our office has ranged from a rooftop deck overlooking the ocean to McDonalds (sometimes you just have no choice). What’s the worst about working while traveling? Any ways you’ve found to avoid or cope with this frustration? Lack of flexibility. I know I mentioned this above as a favorite, but it deserves to be in both categories. Yes, we may be able to take off on a three-week hike in Peru during the slow work time, but we may have to work over Christmas because a client has a project rolling out. It is truly a double edged sword, but one that we are willing to play with. Internet outages. Although it does not happen often, this is definitely the most frustrating for Will. 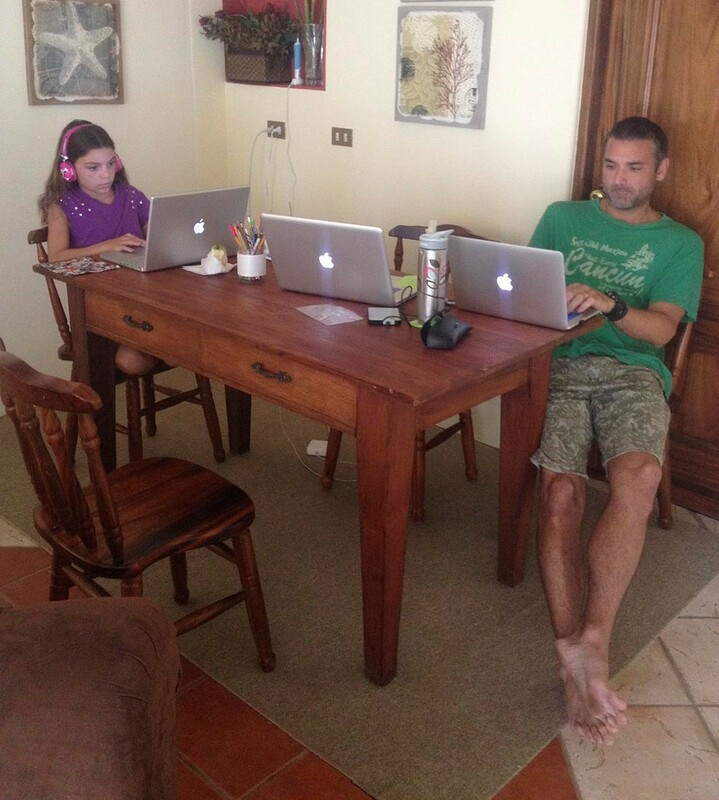 Usually this is when we have to work while on vacations (yes, that still exists in our world). We have taken measures to ensure that any internet outage does not impact us more than momentarily with the internet hotspot, but it is mind-numbingly frustrating nevertheless. Computer issues and the lack of resources to fix them immediately. I can speak from personal experience that this is a complete nightmare. I had my computer go crazy on me after three weeks into our new life in Costa Rica. There was no Apple store, just an authorized repair shop. I had told all my clients that it would be a seamless transition and bam! The solution is to always have a back up computer and make sure all of your work is backed up daily, if not hourly. That is a great question. I think my advice would be to find a career that you love, but also cultivate a passive stream of income as well. I have truly enjoyed being a graphic designer, but I have hit burn out at this point. I am now focusing my efforts on doing work I still love, but work that can generate a passive income as well. Start cultivating passive income at a very young age so if you want to take a year off (and not work) you have that flexibility. As far a being in accounting, Will’s motto has always been to be an expert in areas no one else wants to, but where there is clearly a need. As much as this would be the description of every accountant in his opinion, he hears that there are depths within accounting that even the accountants do not want to enter. Have a skill that is needed and work hard at honing that skill. 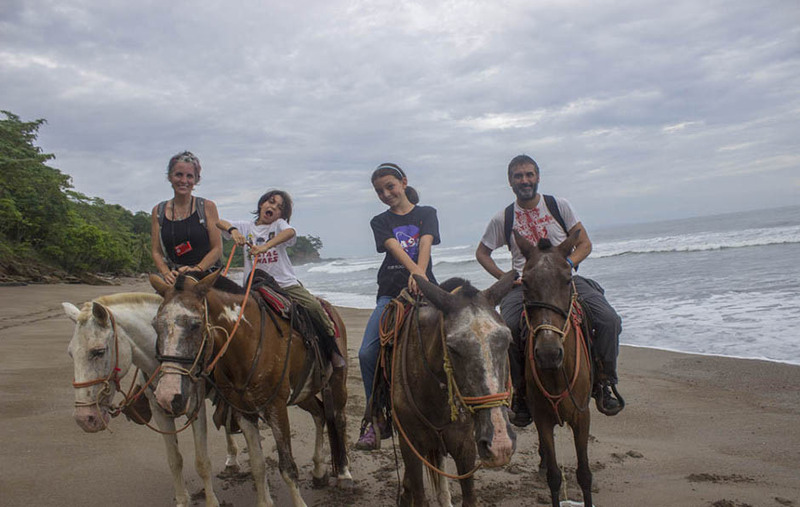 Since we are a traveling family we come in contact with other creative traveling families all the time. I have heard of many interesting ways that people have figured out how to fund their independent lifestyles. I guess my favorite would be buying a boat and then chartering it on week long trips with other families. It is not a new concept and clearly something anyone can do. 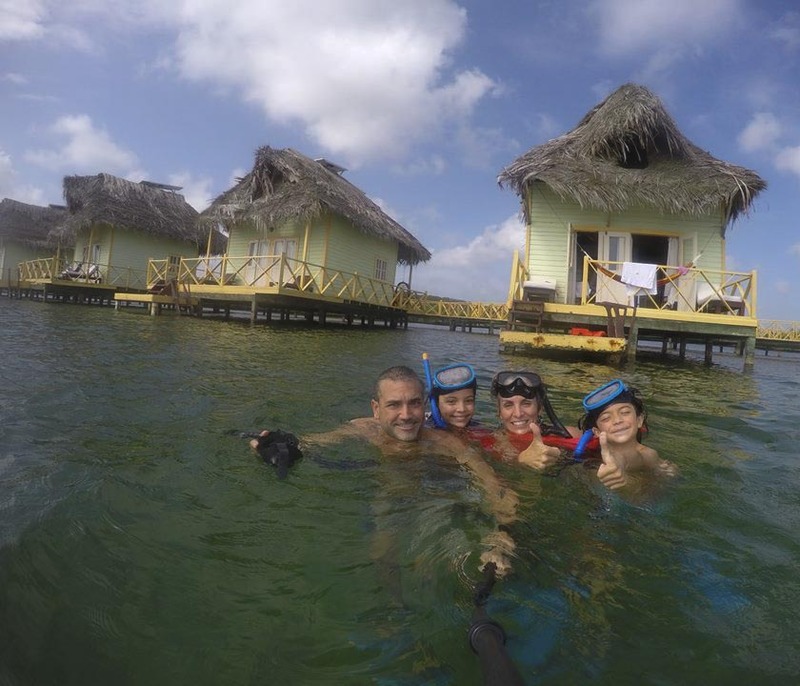 I love the idea of inviting people into our floating home, feeding them delicious meals and taking them on adventures all while making money. Someday. If you enjoyed this story, found it helpful, or have a question, leave a comment below! If you know someone that needs a little encouraging push; please share this story with them. You never know what might ignite that passion to finally make that crazy dream a reality. We created this Make Money and Travel series as a source of inspiration. By sharing examples of real people around the world making money from anywhere and living the lifestyle they want, proves where there is a will, there is a way. If you would like to share your Make Money and Travel story, drop a note in the comments below and we’ll get in touch! Great interview and questions! This one really hit home and resonated with me. Like Will, i’m also a CPA and have been at it for the past 10 years. I’ve been fortunate enough to work as an accountant in some cool places like Banff, the Cayman Islands, Cambodia, Vancouver and now New Zealand. But the 9-5 life is still a struggle and so last week, I quit my job! I have no plans, future prospects or job offers. At times I think WTF have I done, but I knew I just had to make the call, otherwise, I’d never do it and would be perishing away in my desk. Now comes the hard, scary and exciting part. Nikki, I love your Bio about author… we think along the same lines…We are fish eating vegetarians too. I love fish and veggies, fruits, fruit smoothies, veggie juicing, love the afternoon tea of quality all we intake is organic based. For us It is the healthy to do so. I hate spiders and snakes… I love to blog and tell a story I created. To your traveling success hope to meet you one day… who knows what the future holds is the norm… I know we are getting our travel plans together… Yipeeeee! Wow! What interesting coincidences. My wife and I have been considering living and working internationally and the sailboat has been the option we are most inclined to consider. I have been taking sailing lessons. Oddly enough my wife is a graphic designer, and I am studying to get a Master of Accountancy, just like Will and Jessica. We have been watching your channel to pick up tips on living easily, relatively cheaply, and still make the money we need for our daughter and other likely children. Thanks for your work. I’d love to get and hear more. Hi Nikki! Thank you for inspiring me (again)! Shared in http://www.facebook.com/groups/rvhappiness so you can inspire others, too! Thanks Chris and a big thanks for sharing! My husband and I are the flip flop of this family: I am a corporate accountant (Controller) and he is a web designer/internet marketer. We just started full-timing about a month and a half ago, and whereas there have been challenges, it has overall been the best decision we’ve ever made. Being in our mid-twenties, many of our friends and family think we are either a) rich or b) living with no amenities. Neither are true, we just took the plunge! Love seeing your posts and I’m totally excited about the boat!! Have fun! Love this series! It’s an inspiration. Thanks you guys! Thanks Doug. It’s one of our favorites too! So many great people out there making the most out of life! I love that Jessica mentions the double edged sword of flexibility. That is one of the things that a lot of families have this expectation about when they choose to take the plunge and live differently than their family and friends. This expectation of what flexibility means to you is probably going to be different than the reality of it. Lovely article Nikki this is my first time. This was a well written article and a fun glimpse into the Sueiro family’s journey. Thanks for sharing it. I soo agree. The flexibility is a double edged sword. It’s all about figuring out what you want most out of your life and how you want to spend your time. Then designing a life that fits those desires. I feel like this is a challenge in general no matter what lifestyle you are living. However, lots people don’t realize they have a choice. They get stuck in the cog machine of life and forget to think about what they really want and what’s possible. I have only followed you for less than a year and wish I would have found you earlier. My wife and I retired in the spring of 2013 with the intention of spending about 4 months out of the year on the road. We got in a couple good trips before her cancer returned and now we live from doctor’s appointment to doctor’s appointment. At first, they were a month apart but now less. You never know what life will throw at you so I speak from experience when i say. Do it NOW! Don’t wait for the knees to give out before you decide to commune with Nature. We have seen most of the country and hiked many of the trails but oh , how I wish, we would have done more when we were physically able. Thanks for letting us now follow along with you. We always say its never too late. Sorry to hear about the wife’s cancer…that is terrible. Glad to have you following along with us until you can get out there again yourselves. Hopefully soon! Tell her to give that cancers a swift kick!!! One of my favourite travelling families. I’ve followed The Sueiro’s for a long time and got to know Jessica through an intimate “build your dreams” group…..they walk the walk and tell it how it is-it’s not all roses but it’s worth it. I don’t know. This kind of lifestyle takes balls, and I’m not sure I have any. Erin – It’s ballsy, but boy does it pay off! Really enjoy the Make Money & Travel series and have read every one. 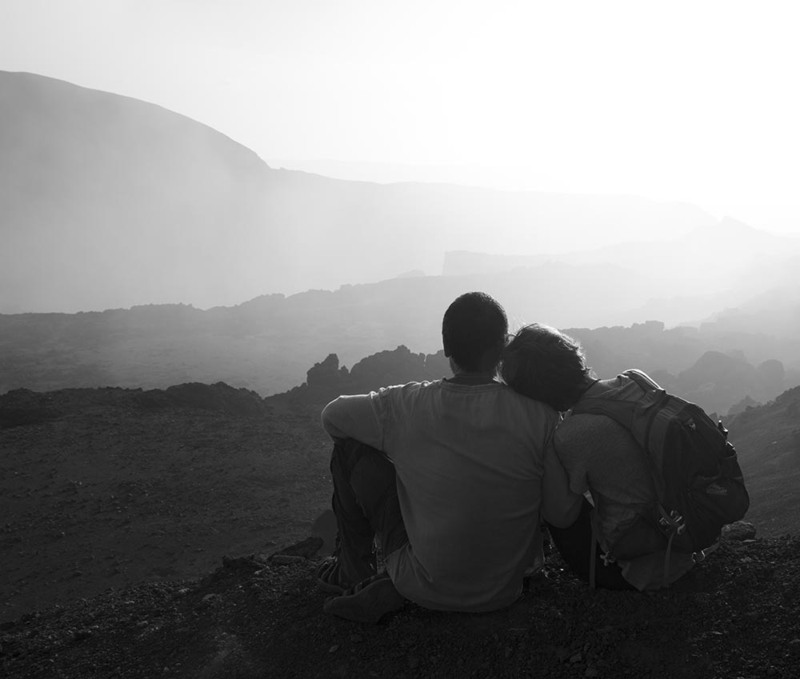 It takes a strong relationship to do this, especially if the travel also includes a change of career. When some of us were your age there was no internet, at least not like it is now, so if you wanted to travel and work your choices were pretty much between physical labour, teaching or nurse/doctor. I know of a few people who did go off and travel, taking jobs on the way when the need for currency became important. But none of the people I knew did it with children – that would defiantly add complexity. Therefore I am very impressed to read about couples & children making it work. Some jobs are not ‘portable’ (e.g. pilot) so I could never consider it for me so I’m glad you are letting us enjoy the stories of other’s lives. Thanks for doing the hard work to develop this post. It seems you are now fully in the international mindset. I look forward to hearing about your own adventures on sea and abroad. I retire May 1 and my wife and start our first traveling by RV. I will continue to teach at an online university. Lookin forward to it! Wow what an in depth interview! Excellent work, should have been a journalist perhaps? I think the thing i like the most about your site, what you do, who you guys are is the positive optimism. I get these recommendations from youtube and wow there is so much fear and negativity it might as well be watching the news, except made up by regular people. It can make the world seem like a very bad place with police caught on tape and all that kind of stuff. You guys are such a breath of fresh air to the negativity and people who seem without any hope at all. The Sueiro family is a wonderful bunch it’s easy to see. So glad they are able to live like this, what an example they set. Keep up the great videos and posts, so much inspiration! My wife and I wish we had followed our dream 15-years-ago that was to travel this great Nation that we love in. Thank you for allowing us to follow your dreams and adventures as you flow throughout the land. Someday, with the Lord willing, we will meet up with you before you give up the wheels of freedom for the waves to other places. What a great article! The questions were on-point and Jessica’s honest, detailed answers were extremely helpful. This has given me much to think about, some excellent encouragement and a fun or helpful article to share with friends who wish they could pursue their dreams. Thanks, Nikki. when are you guys going to shoot the video on if you can run your air conditioner on solar. Excellent post! It was great to hear someone else’s experiences in living and working abroad. Great advice!